The Institute’s inaugural Australian Achievement in Architecture Awards were held on 18 March at the Gallery of Modern Art in Brisbane. The “people-based” awards event was led by the Gold Medal and included the presentation of the Neville Quarry Architectural Education Prize, the Bluescope Glenn Murcutt Student Prize, the Dulux Study Tour winner, the Colorbond Student Biennale winner, the Student Prize for the Advancement of Architecture and a new award, the Leadership in Sustainability Prize. Kerry and Lindsay Clare. Portrait by George Fetting. The Gold Medal is the Australian Institute of Architects’ highest accolade. It recognizes distinguished service by Australian architects who have designed or executed buildings of high merit, produced work of great distinction resulting in the advancement of architecture, or endowed the profession of architecture in a distinguished manner. Lindsay and Kerry Clare have made an enormous contribution to the advancement of architecture and particularly sustainable architecture, with a strongly held belief that good design and sustainable design are intrinsically linked.Since starting practice in 1979, Kerry and Lindsay were key to pioneering the regional style associated with the Sunshine Coast. They are widely regarded for projects that display contextual sensitivity, clarity of design and environmentally sustainable principles. Their projects have won prestigious awards, including twenty-eight state and national awards from the Australian Institute of Architects for housing, public, educational, commercial and recycling projects. In the late nineties, Lindsay and Kerry left their office on the Sunshine Coast, and joined the New South Wales Government Architect’s Office as Design Directors. In two years they achieved many design successes in urban contexts and made an impact with buildings such as the No. 1 Fire Station in Sydney City. Since that time they have been founding design directors with Architectus. Here they have produced a highly significant cultural building, winning the design competition (with James Jones) for the Queensland Gallery of Modern Art (GoMA) in Brisbane. Major awards include the 2008 AIA Queensland Public Architecture Award for the University of Sunshine Coast Chancellery, the 2007 RAIA National Public Architecture Award for GoMA and the RAIA Robin Boyd Award in 1992 and 1995. 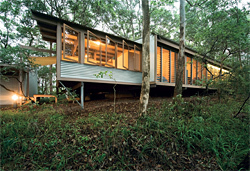 The recently presented 25 Year Award for Enduring Architecture (Queensland State Awards) for the White Residence, designed while in practice with Ian Mitchell, is a testament to the quality and longevity of their work. The essence of the Clare design philosophy comes through in the GoMA, where simplicity, light and spatial qualities combine to produce a building of timeless elegance, which will serve the public well into the future. Kerry and Lindsay Clare are highly respected and contributing members of the architectural profession. They have been actively associated with the Institute, participating on a number of committees. Kerry was also a national awards juror in 1999 and 2004, and a national councillor from 2000 to 2002. Lindsay was a national awards juror in 1996.They have always been willing to give time to furthering architectural education and were Adjunct Professors to the Faculty of Architecture, University of Sydney from 1998 to 2005. Kerry is a member of the City of Sydney Design Advisory Panel, providing advice on public and private developments to maintain high standards of urban design. She also serves on the Design Review Panel (SEPP 65) for Randwick and Waverley Councils, where she assists in the review of development applications, assessing their contribution to urban design, environmental, social and aesthetic issues. Their great body of work demonstrates an appropriate environmental response, developing the concepts of efficient low-energy, sustainable solutions decades before legislation made it mandatory. Their Cotton Tree social housing project was selected as one of ten worldwide for inclusion in Ten Shades of Green in New York: an exhibition demonstrating architectural excellence and environmental sensibility organized by the Architectural League of New York. In 1996, this project received the RAIA Multiple Housing Award and the National Environment Citation. 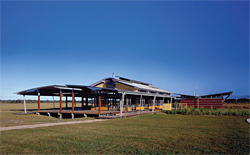 In 2001 they received the Energy Efficiency Award from the Urban Development Institute of Australia for the National Environment Centre. 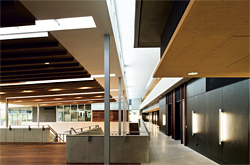 In 2009, the University of the Sunshine Coast Chancellery received the Institute’s Harry S. Marks Award for Sustainable Design. Their work has been included in over 150 national and international books, periodicals and publications. They have been exhibited widely – in New York, Tokyo, Sydney, Melbourne and Perth, and in the 1991 and 2008 Venice Biennale, the1996 Milan Triennale and the 1996 UIA Congress Barcelona. The Gallery of Modern Art in Brisbane is included in the Phaidon Atlas of Twenty-First Century World Architecture.The Clares’ work is extensively featured in a new book, Architectus: Between Order and Opportunity by Haig Beck and Jackie Cooper. The Australian Institute of Architects recognizes and honours Kerry and Lindsay Clare as the 2010 recipients of the Gold Medal. Melinda Dodson (chair), Howard Tanner, Adjunct Professor Ken Maher, Sue Phillips, Professor Gordon Holden. Thrupp and Summers House, 1986–87, as rephotographed by John Gollings in 2008. Gallery of Modern Art, Brisbane. Photograph John Gollings. Lindsay Clare was born in Brisbane in 1952. He enrolled in quantity surveying at the Queensland Institute of Technology (QIT) and completed four years of the course before deciding to transfer into the Diploma of Architecture program. 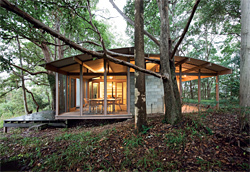 As a part-time architecture student, he worked on the Queensland Sunshine Coast in the office of Gabriel Poole, where he met his future wife and partner, Kerry Clare. Kerry Clare was born in Sydney in 1957; her father was an industrial pattern maker, mechanic, inventor and owner of a Sydney Citroën dealership. As a teenager she lived in pre-Cyclone-Tracy Darwin, before enrolling in the part-time architecture course at QIT. Lindsay Clare grew up sleeping on the verandah of a vernacular Queenslander house. During her teens, Kerry Clare lived in Darwin in a standard government house with entire walls of louvres designed to ameliorate the tropical climate without airconditioning. These childhood experiences of how to adapt houses to the climate were reinforced during their apprenticeship to Gabriel Poole. In 1979, after working with Poole for almost five years, they established a practice (later to be called Clare Design) on the Sunshine Coast. Their early work was mainly residential and small commercial and institutional projects. With ten architectural citations and commendations during the first ten years of practice, they quickly earned a reputation for elegant and constructively expressive lightweight houses with interiors bathed in natural light and cooled by natural ventilation. During the mid-1980s, the Goetz House (1984–85) and Thrupp and Summers House (1986–87) brought national recognition. The houses are significant milestones on the Clares’ path to aesthetic consistency and formal clarity. Of the Goetz house, Professor Michael Keniger says, “Despite being modest in size, this small house demonstrates a startling clarity of resolution and responds directly to the imperatives of place-making. Here, the enclosure of dwelling is stripped back to spaces directly derived from the two analogical sources of ‘cave’ and ‘bower’ … Within there is an almost obsessive rigour to the separation of served space from service space, and enclosed space from open … [An east–west] backbone is provided by the axial gallery. To the south [of it] are the ‘caves’ of fair-faced blockwork housing utilities … On the north are the ‘bowers’ of stick and panel, of glass and [flywire] mesh that shelter the living and sleeping spaces.”1 In 2008 John Gollings photographed the Thrupp and Summers house. His pictures capture the essence of the Clares’ contemporary modernism. The house is so lightweight that it seems to float in its bush setting. To the keen eye, the structure is rational and legible, yet its presence is recessive, an almost subliminal pattern, enough to suggest an order and rhythm that establish scale and proportion, depth and dimension. The interior is a light-filled volume composed from a limited palette of honey-coloured natural timber and fair-faced concrete blockwork set against a background of surfaces reduced to white planes washed by natural light. The long north-eastern wall of continuous full-height glass louvres dissolves the barrier between inside and out: house as abstracted verandah. 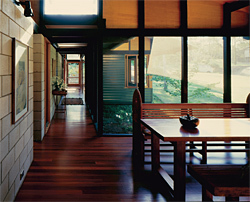 The coolness of the Queensland verandah and a sense of cross-ventilating breezes, typical of the Clares’ architecture, are almost palpable in Gollings’ images. Looking at them, you would assume this house to be the very latest demonstration in a long line of elegant subtropical coastal houses designed by the Clares. But while Gollings photographed the house in 2008, it was actually designed and built more than twenty years before – and could have been designed by the Clares at any time over the past twenty years. The Clares’ work attains timelessness. The architects eschew those popular architectural gestures that unerringly date so many contemporary buildings. Their approach to architecture is guided by a set of commonsense rules of thumb: buildings must respond to the climate and topography of a place; legibility is desirable and best achieved with simple forms sheltering, ideally, under a big roof; and the finishes of materials, the manner of their fixings and the junctions between them should express their inherent nature. For more than thirty years, the Clares have applied this approach. 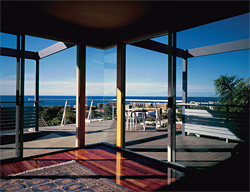 In 1991 their McWilliam House (1989–90) was shown at the Venice Biennale. 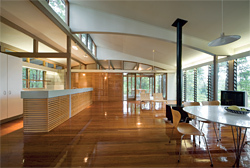 In 1992 their own Buderim House (1990–91) won the Royal Australian Institute of Architects (RAIA) Robin Boyd (National) Award for houses – as did the Hammond Residence (1993–94) in 1995. 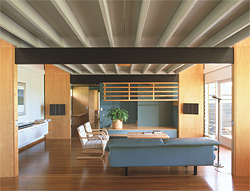 Between 1982 and 1997, the Clares also won the RAIA Robin Dods (Queensland House of the Year) Award an unequalled six times. 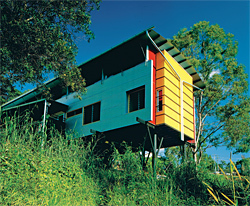 The Clares designed their own house as an experimental speculative development, a prototype for “a low-cost alternative to the fully tailor-made house”. Peter Hyatt describes it as follows: “To achieve low construction costs, the structure … [is] a two-storey timber box, framed and braced by plywood ‘fin’ walls along the perimeter. 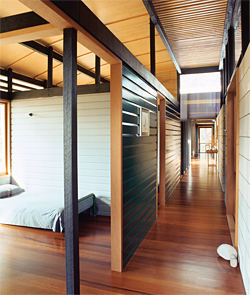 These fins form alcoves … useful areas for entry, storage or work [benches] … No internal walls are required for bracing or load bearing … The house [has] a loose-fit skeletal structure that can be clad and subdivided according to site, program and material preference.”2 Structurally, the house is a timber box. Formally, it is a tin box, but one with multiple readings that combine to give the whole an air of lightness. The roof, no more than a thin plane of corrugated iron, appears to have been draped over the top of this box and anchored by sculptural downpipes; the long sides, slightly thicker planes of corrugated iron, are not so much attached to the box as propped up against it; and at either end, brightly painted cement sheet boxes read as the ends of a longer but smaller box protruding from the larger box. At each end, the dark painted wall surfaces between these two boxes, and between them and the roof, can also be read as void. The apparent fly-away layered lightness of the whole is further reinforced by the floating planes of corrugated iron that form the roofs over the terraces and the carport. 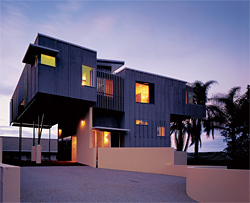 Two works of the early 1990s added to their repertoire of innovative typologies for subtropical housing and low-impact environmental design: Rainbow Shores (1990–92) and Cotton Tree Pilot Housing Project (1992–95), which won the national RAIA Environment Citation (1996). This latter work was chosen in 2000 from an international field of “green” buildings for inclusion in the Ten Shades of Green exhibition in New York, an exhibition demonstrating architectural excellence and environmental sensitivity organized by the Architectural League of New York. Herbert Muschamp, architectural critic of The New York Times, wrote that it was “the most romantically utopian project on view … The most utopian aspect … is its atmosphere of social and spatial informality. It picks up on the direction in which American architects were headed in the postwar years, when California’s Case Study Houses, designed by Charles and Ray Eames and others, wove spare, modern design into the West Coast landscape … Why should the Australians run away with a style of living that began with Frank Lloyd Wright?”3 In 1998 the Clares were appointed Design Directors to the NSW Government Architect. The move to Sydney provided opportunities to work on larger projects than was possible in regional Queensland and the chance to teach, as adjunct professors in the University of Sydney Faculty of Architecture (1998–2005). 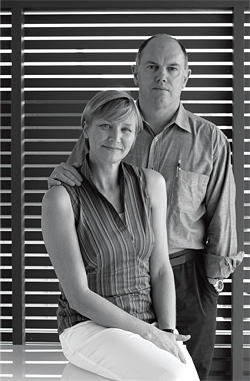 The Clares left the NSW Government Architect in 2000 to become founding directors of Architectus Sydney in 2001, a federation of architectural practices formed from offices based in Auckland, Brisbane, Melbourne and Sydney. In the same year, now as design directors of Architectus (and in conjunction with James Jones), they won an international competition for Queensland Gallery of Modern Art (GoMA, 2001–06; RAIA National Award for Public Architecture, 2007). In many respects, GoMA is a defining work: a significant civic building that encapsulates the Clares’ architectural position and design strategies. The plane of the big roof echoes the siting of the building on the river flats, reinforcing local perceptions of place. Typologically, it is a big box under a big roof – a recurring formal theme in their work, and a building form reminiscent of both the traditional Queenslander and the backyard shed (both familiar types). The campus planning ordered around cross-axes of circulation is also typical. Along the cross-axes, natural light is introduced from above and at the edges of the building. The cross-axes/campus planning strategy is a flexible, loose-fit strategy that corresponds with their aesthetic approach to building finishes, which is also loose-fit. The Clares produce an architectural poetic based on expressing all the finishes as layers floating over the structure. The layering and overlapping of surfaces overcome imprecision and cover up mistakes in an often roughly assembled underlying carcase. For the Clares, layering is both a loose-fit aesthetic and a very practical loose-fit way of constructing buildings. An art gallery is required to be a sealed airconditioned box. 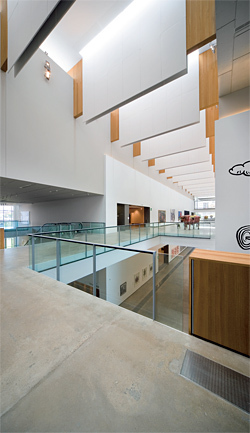 Consequently, although GoMA is shaded, the Clares were denied the opportunity to introduce natural ventilation into the building. 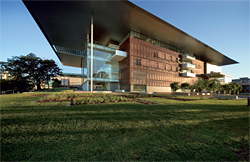 This central aspect of their design position was addressed in their next major civic building, the Chancellery for the University of the Sunshine Coast (2003–06), which adheres to all the design strategies observed in GoMA and incorporates a sophisticated system of active natural ventilation – such that it won both the Australian Institute of Architects Queensland Public Architecture Award and the Harry S. Marks Environment Award (2008). The climatic strategies are largely ones tried and tested over many years by the Clares in their domestic work, here scaled-up and mechanized. Sunhoods – similar to ones they have used in houses, but much longer – shade windows. On its southern side, the entire building opens to form a shady civic-scaled verandah that captures the prevailing south-easterlies. To enhance cross-ventilation, the deep plan is a campus of buildings separated by “external” streets, all under a single roof with vented skylights. To minimize the impact of solar gain on the thermal mass of the building, masonry walls are clad with a weatherproofing and sunshading skin (reverse veneer) of either corrugated iron or cement sheet. In the heat of summer, when the windows in the seminar rooms and staff offices are opened to admit the north-easterlies, electric relays automatically shut down the local split-system airconditioning units and open high-level louvres on the leeward side of the room. For larger-scaled commercial projects, the rules-of-thumb principles and simple passive controls used for domestic buildings are not enough: a more scientific approach is necessary. The Green Building Council of Australia (GBCA) has developed the Green Star Office Design rating tool, a holistic environmental rating scheme for commercial buildings that measures environmental performance over a range of criteria including water and energy consumption, materials, indoor environmental quality, site considerations, emissions, transportation and the long-term environmental management of a building. On a six-star rating scale, five stars denotes a degree of excellence that surpasses the top quartile of the industry. Wesley House, a slender ten-storey office building in the heart of Brisbane (completed in 2009 in association with Fulton Trotter Architects), achieves a five-star rating. It features chilled beam technology with a 100 percent fresh air supply; fixed shading “blades” on all glazed facades (computer-tested); fritted double glazing with low-E glass; water-efficient fittings, using rainwater harvesting for toilet flushing; bike racks and showers for cyclists; low-emission interior finishes, recycled construction materials and the recycling of construction waste; computer-generated studies for optimum day lighting; and a building user guide, an environmental management plan and post-occupancy evaluation and tuning. Wesley House does not overtly express its green credentials. With the exception of the sunshading blades, much of the Clares’ attention to environmentally sustainable design (ESD) is concealed from view. And even the blades read not so much as sunshades but as a delicate tracery of lines that form the urban-scaled backdrop to the little red brick Neo-Gothic church that stands in front – a bit of the city’s Victorian heritage left stranded, like a fish out of water, by the surrounding high-rise offices. Unlike the traditional university college, with its dining hall and common rooms, student housing for the University of New South Wales (completed 2010) is modelled on the apartment type. Some 240 apartments accommodate 1,030 students; 70 percent are five- and six-bedroom “household” units (the balance are mostly one- and two-bedroom units). The apartments are planned around courtyards interconnected at ground level by breezeways. The complex forms part of the campus “village”, with its theatre, shops, cafes and village green. Most of the units are located within “thin-plan”, eight-storey wings running north–south. The configuration provides a double aspect and cross-ventilation to the living/dining/kitchen areas. Similar four-storey blocks line the northern (street) boundary, low enough to allow sun into the courtyards. Entry foyers at every level are naturally lit and ventilated. Concrete floors and walls provide the thermal mass necessary for comfortable temperatures without airconditioning. To minimize heat gain (and loss), walls are insulated on the external face and clad with a weatherproofing and sunshading skin (reverse veneer) of timber battens or a thin outer layer of concrete over polystyrene (the Thermomass panel system). Sunhoods shade windows. The most ingenious aspect of the design – the Clares’ solution to cross-ventilation for rooms opening off a double-loaded corridor – is largely hidden from view. The concrete floor slabs have hollow cores, tubes opening to the exterior which are used for cross-ventilation when bedroom doors and windows are closed. The building does not flag its green attributes: they exist to be experienced. Haig Beck is a Professorial Fellow in the Faculty of Architecture Building and Planning at the University of Melbourne. He and Jackie Cooper are the editors of UME, an international review of architecture now published free online (www.umemagazine.com). They are the authors of Architectus: Between Order and Opportunity (ORO, USA and Singapore, 2009), which features the work of the Clares. 1. Michael Keniger, Australian Architects: Rex Addison, Lindsay Clare & Russell Hall (Royal Australian Institute of Architects, 1990), p. 36. 2. 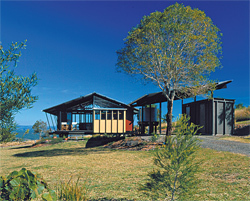 Peter Hyatt, Local Heroes: Architects of Australia’s Sunshine Coast (Craftsman House, 2000), p. 188. 3. Herbert Muschamp, “Good Buildings and Good for You”, in the Art/Architecture reviews, New York Times, 2000. 4. Christian Norberg-Schulz, Meaning in Western Architecture (Studio Vista, 1975), preface. I first met Lindsay and Kerry Clare in 1994, when I was introduced to their impressive work on the Sunshine Coast. As a member of University Council, Lindsay had an important influence on our architecture direction as a new university, and as a team they were both influential in USC, in effect creating a subtropical architectural laboratory for institutional buildings. It is an approach that has paid handsomely for the university. The Clares have designed two of the university’s buildings; the Chancellery is the most recent. With both buildings we established a close relationship between architect and user, which led to outstanding design, and the buildings have been highly successful. The Clares have deservedly be seen as leaders in their profession for some time and their national and international expertise is now unquestioned. Vice Chancellor and President, University of the Sunshine Coast. In 1980 as a recent graduate I started work with Lindsay and Kerry Clare in their first office, a sunroom overlooking the river in their rented Queenslander at Mooloolaba. These were the days before faxes, let alone internet or emails, when hand drawings were copied by dyeline and specifications laboriously typed in carbon triplicate. In the first weeks, business was conducted from the payphone down the street. Later we moved to the “real office” at Lindos on Alexandra Headland, an elegant, white, bagged brick Mediterranean modern apartment building and office designed by Gabriel Poole. Everything was neat, cool, efficient, organized, crisp, controlled, but relaxed enough to down tools when the surf was up. Kerry proceeded to have five kids (to my two) without apparent effort while calmly continuing practice. Impressive. Kerry and Lindsay had met as young architecture students in Gabriel Poole’s office in Mooloolaba. (GP: “I’ll give you a job if you can draw” – Lindsay’s high school art folio served to snag the job.) Though they studied part-time at QIT, Kerry and Lindsay regard themselves as largely self-taught, learning through direct practice and through their own enquiry. Their various Citroëns regularly covered the 250 kilometres to Brisbane and back for whatever architecture talk or event was on. Gabriel’s library introduced them to Aalto, inspiring personal study tours to Finland. In regional Queensland at that time there was little general regard for architecture. However, discerning clients brought the Clares good commissions. Each project was an education, building their confidence, architectural sophistication and reputation. Houses were developed from careful consideration of site, climate and client brief, and arranged for unhampered enjoyment of glorious settings – on mountainside, in rainforest, viewing out to sea. Each evolved its own system, structure and presence. Overlaying the Clares’ clear logic was a subtle subjectivity. There were discussions of compositional nuance – a 6B refining the arc of a curve or the placement of a window for a particular painterly effect. Many of the early houses were built by Mal Dickson, a gentleman craftsman. Lindsay had worked “on the tools” with him in some down time from Poole’s practice and got an invaluable practical education in construction and detailing. (MD: “So you’ve drawn this detail … you can build it!”) There were many others who shared the youthful studio at Lindos, including Ian Mitchell, Vito Villari, Mark Jones, Lee Wade, Alan Marrs, Annabel Lahz, Geoff Cook, Chris Gee, Mark Roehrs, Richard Kirk, Chris Bligh and others, all enjoying the beach locale and learning from this exciting period of design and the realization of projects. The rare privilege of this experience was underscored when London’s Peter Cook visited Lindos for a barbecue. Having yet to realize a built work himself, Cook was amazed by the extensive folio of completed work by these young architects. Through the later 80s and 90s there was a natural desire by the Clares to undertake larger projects. The Rainbow Shores and Cotton Tree multi-residential projects provided the opportunity to successfully translate their residential architecture to the larger scale. However, despite wide recognition for their contribution to the design character of the Sunshine Coast, significant commissions for institutional or commercial work passed them by. By the late 1990s Clare Design still had few large commissions, so when the opportunity to contribute to the public realm through the office of the NSW Government Architect came, it was too good to refuse, even though it meant leaving their coastal roots. As Aalto inscribed on his motorboat forty years earlier – nemo propheta in patria – nobody is a prophet in his homeland. Elizabeth Watson-Brown is director of Elizabeth Watson Brown Architects. Goetz House, Buderim. Image: Richard Stringer. Goetz House, Buderim. Image: George Seper. Clare Design—project team Lindsay Clare, Christopher Gee, Annabel Lahz, Karen Johnson, Kerry Clare. RAIA (QLD) Citation for Meritorious Architecture, House of the Year 1985. RAIA National Commendation – Robin Boyd Award, 1985. Thrupp and Summers House, Nambour. Image: John Gollings. Clare Design—project team Lindsay Clare, Ian Dimond, Alan Marrs, Kerry Clare. RAIA (QLD) Residential Commendation, 1989. McWilliam House, Alexandra Headland. Image: Richard Stringer. Clare Design—project team Lindsay Clare, Alan Rogers, Richard Kirk, Rob Keen, Kerry Clare. 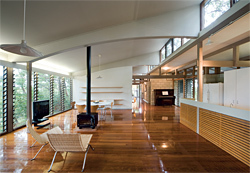 Clare residence, Buderim. Image: Richard Stringer. Clare residence, Buderim. Image: Reiner Blunck. Clare Design—project team Kerry Clare, Lindsay Clare, Denise Chen, Jeff Lee. RAIA (QLD) Robin Dods Award, 1992. RAIA (National) Robin Boyd Award, 1992. Rainbow Shores, Surfside. Image: Richard Stringer. Clare Design—project team Lindsay Clare, Geoffrey Cook, Alan Rogers, Leo Rogers, Jeff Lee, Phillip Smith, Kerry Clare. BHP/Belle Steel Futures Award, 1993. 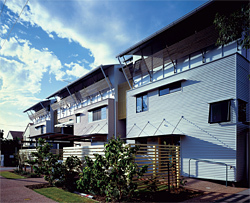 RAIA (QLD) Multiple Housing Award, 1995. Cotton Tree Pilot Housing. Image: Richard Stringer. Clare Design—project team Kerry Clare, Lindsay Clare, Terry Braddock, Scott Chaseling, Jeff Lee, Alan Rogers, Troy Zwart. 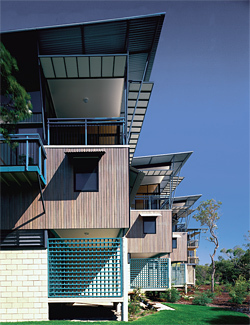 RAIA (QLD) Multiple Housing Award, 1996. RAIA National Environment Citation, 1996. Hammond House, Cooran. Image: Adrian Boddy. Clare Design— project team Kerry Clare, Lindsay Clare. RAIA (QLD) Robin Dods Award, 1995. RAIA (National) Robin Boyd Award, 1995. 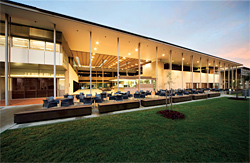 Recreation Centre, University of the Sunshine Coast. Image: Richard Stringer. Clare Design—project team Kerry Clare, Lindsay Clare, Stephen Cameron, Scott Chaseling, Jeff Lee. RAIA (QLD) Highly commended – F.D.G Stanley Award, 1998. Gallery of Modern Art, Brisbane. Image: John Gollings. If there is a true successor to Glenn Murcutt’s ethos of “touching the earth lightly”, it is surely the prolific career of Lindsay and Kerry Clare. However, it is one thing to pursue this light touch where the works in question have a decisively residential character, where the budgets are often modest and where the sites, more often than not, have a seemingly unspoiled rural character. It is another thing entirely to sustain this lightweight, metabolic feel with major public commissions. Such projects began to enter into the portfolio of their expanded firm of Architectus at the millennium. Even so, something of the regional “outback” aeronautical feel is still obtained with such considered pieces as the Chancellery of the University of the Sunshine Coast (2006). Where this takes one, with regard to the erstwhile theory of critical regionalism, it is hard to say. Surely the stakes have shifted over the years and the scale and size at which successful architects are now being asked to design and build is daunting, to say the least. Perhaps the more crucial challenge today is to be able to create convincing megaforms with which to compensate for the loss of the public realm in the l ater modern, megalopolitan world. In this regard, one could perhaps claim that among the more convincing large works produced by their firm in recent years is their monumental but highly accessible Gallery of Modern Art, Brisbane. Kenneth Frampton, Columbia University, New York. Adrian Esdaile, Ali Johnston, Alison Brookbanks, Aurelio Marano, Barbara Flynn, Belinda Pajkovic, Blair Johnston, Britta Siggelkow, Christine McLennan, Darrin Rodrigues, Deirdre Coffey, Felix Winter, Geoffrey Way, James Jones, James Pilcher, Jason Jondreau, Jason Tsai, Jiang Bo Wang, John Jeffrey, John Norman, Kathy Kralj, Kerrie Campbell, Kerry Clare, Leonardo, Arias Galarz, Lindsay Clare, Mark Curzon, Martin Chan, Michael Harris, Petrina Moore, Renee Clare, Richard McEwen, Richard Travis, Rodd Perey, Rosemarie Gidaro, Sandy Strazds, Sarah Blacker, Simon Zou, Stefan Van Moll, Stuart Murchison, Thilo Nuessgen, Valeria Buccheri, Vanessa Gribben. Brisbane project team John Grealy, George Saldais, Ian Thomas, Clark Ingram, Keith Allen, Allan Rielly, Michelle O’Leary, Ray Smith, Jon Percival, Michael Ray, Ashley Beckett, Chloe Comino, Peter Roy, Caleb Smith, Kirstin Tocker, Mark Medcalf, Clair Keleher, Liz Park. 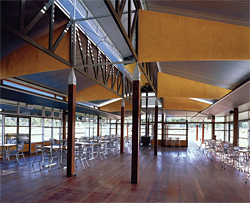 Australian Institute of Architects (QLD) Public Building Award, 2007. Australian Institute of Architects National Award for Public Architecture, 2007.
International Design Competition Winner, 2001. Chancellery, University of the Sunshine Coast. Image: John Gollings.